Patty's Utopia: Hispanic Heritage Month In Seattle. Hispanic Heritage Month has been around for quite some time now. If you go to the Wikipedia website, you will find the story of how it became a month long celebration. But that’s not what I will be talking about here today. Because of the great diversity in the city of Seattle and thanks to the welcoming of this diversity by its residents, the events celebrating our Latino/Hispanic heritage and our contributions to the United States are becoming more and more popular! Tomorrow, to start the Hispanic Heritage Month celebrations, we are holding a community parade in the city of South Park at 11 a.m. The parade will begin on 14th Avenue South, from South Henderson Street to South Cloverdale Street and end at the South Park Community Center. Following the parade we will have the “Fiestas Patrias” celebration at the Seattle Center on Saturday from 12:00 p.m. to 10:00 p.m.; and on Sunday from 12:00 p.m. to 6 p.m. I invite you to come and celebrate with me our Latino heritage and our contributions to this beautiful country with great music, good food, and why not, some dancing too! 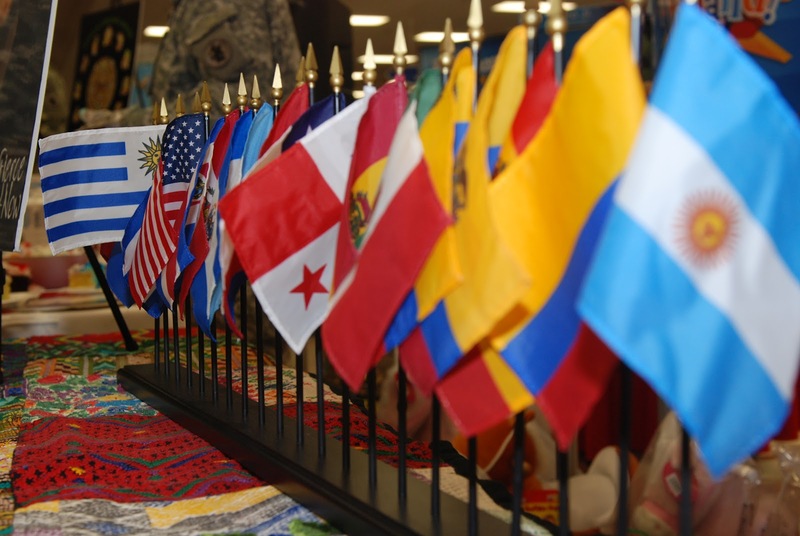 Various flags on display for Hispanic Heritage Month.